I’ve been working on this new release for EMC Storage Analytics (ESA) 2.0 for what seems like ages now. The first two releases of ESA (1.0, 1.5) supported the VNX platforms. 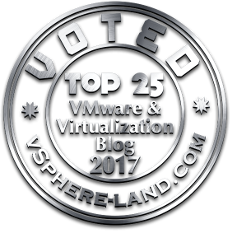 The 2.0 release is the first with VMAX support! As the Symmetrix engineering contact for the VMAX component of ESA, I have had first-hand input and testing of the product, along with putting together a good part of the documentation. This post jumps the gun a little as the product will be officially revealed next week at VMworld but what’s a little pre-announcement among friends? I’ll give a brief run-down of the release below. 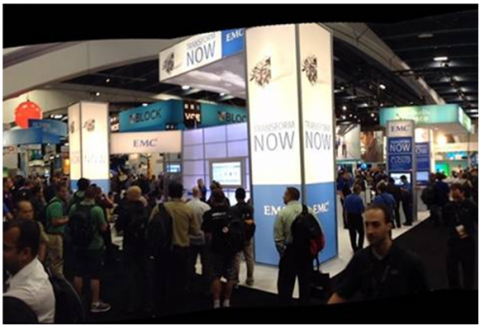 The EMC booth at VMworld 2013!! Don’t miss it! As with most events, EMC goes all out. This years’ VMworld 2013 is no exception. Besides the myriad of sessions, meet-ups and parties, the EMC Booth has a lot in store for those who stop by. I cannot disclose everything the EMC booth will offer (tons of great surprises and *cough* prizes *cough* might be planned) but here is a little sneak peak! This is a topic that I get asked about a lot and a recent internal email thread prompted me to write a post about it. On a Symmetrix array if you want a volume larger than 240 GB you need to create a metavolume. When creating a metavolume you have two configuration choices; concatenated or striped. There are many benefits to striped over concatenated (all of them performance-related) but one disadvantage. Due to their nature striped metavolumes are harder to expand. Until a few years ago thin striped metas couldn’t even be expanded online. So the decision was easy–do you think you will need to expand or not. In Enginuity 5875 and Solutions Enabler online expansion of striped metavolumes was allowed. EMC Storage Integrator 3.0 released! Storage control activities for Microsoft System Center Orchestrator. All the information that you need to use the VMAX content pack is included in the download so I’ll keep this blog entry short. There is also a demo you can view to get an overview of the capabilities of the content pack. Cody recently posted an entry that discussed how Solutions Enabler can be configured to send logs to VMware vCenter Log Insight (https://www.codyhosterman.com/2013/07/10/using-vmwares-vcenter-log-insight-with-symmetrix-vmax/). He mentioned that in order for Unisphere for VMAX to send its information, additional configuration was required. So here is that additional information.